Goose Creek Candles is a company that sells all kinds of scented candles. For my review, I was sent an Angel Kiss candle and a Strawberry Rhubarb candle. Both of these smell incredible. The strawberry rhubarb is summery and light but I will still use it through the winter. The angel kiss is mouthwatering. It is a mix between brown sugar cookies, buttery toffee and vanilla ice cream. This is definitely my favorite. The candle comes in different sizes and is $18 for a 16 ounce candle which is supposed to burn for 90 hours. It is an early 1900’s Victorian multi-sided style jar with beautiful polished silver embossed lids. The jar is exclusive to Goose Creek and is available in three sizes. These candles are the strongest on the market. Clean burning; elegant fragrances set us apart from any other brand. If you are looking for any candles, you have to check out their line of Autumn Breeze candles. They look amazing! They have scents like apple cider, whipped pumpkin and caramel apple. Both of the candles that I was sent burn cleanly and you can smell the wonderful smell through the house. 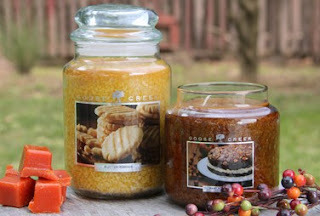 Check out Goose Creek Candles for gifts for this upcoming holiday season or to make your home smell great this fall.